The holidays, last December I mean… were a bit of a blur. With the break up and not knowing what or where to spend the holidays I ended leaving town for a stretch of days to be with my family and then a little time away from everyone with the exception of my dog…. 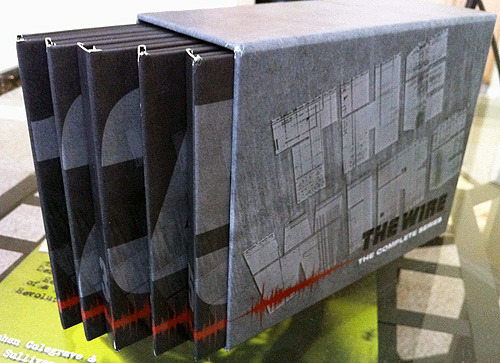 One of the highlights of the weekend was getting a box set of DVD’s from my mom for the tv show - the WIRE. A show that I’ve been meaning to watch for years but I never got around to it. The box set ended up sitting on my shelf (wrapped) until last week when I decided (while under a lot of head cold medication) to finally open it so I could give it a proper viewing. In that time I’ve slowly clawed thru the first 2 seasons - watching an episode here and there - allowing myself to sit back and reflect on dialogue and the over all story arch. In short - its possibly the finest produced 25 or so episodes that I have ever seen strung together. If all goes well, I hope to finish up the series in the next couple of weeks… and have enough under my belt to talk to my friend Clay about it at his post-bar exam party next weekend.